So a friend and I went to get a tree last night. There are three churches within a few blocks of my building selling trees; we parked between two of them and started the search. As we walked to the second lot, he noticed a sign advertising a nativity scene with live animals. It was going to start in ten minutes. Needless to say, we finished the tree shopping nonsense and went to check out the live nativity. There was a black sheep, a white sheep, two miniature goats and two llamas. Llamas. The best possible justification we could come up with is that the llamas were taking the place of camels, since llamas are far more common in this area. Of course, the other possiblity is that llamas were found in the Middle East in those days and it's only in modern history that llamas are more commonly found in Peru. The fellow playing Joseph came out and introduced himself as Jason and the woman next to him as his wife Mary. Then I realized that made no sense and he'd probably said Joseph and I just misheard him. So we had wandered over and were admiring the llamas, while Joseph/Jason continued his recounting of the first Christmas. I was half-listening as he talked about an angel telling him that the baby was not his and was God's and how that's a difficult circumstance because you can't tell God to step off. (Other things that you can't tell God are to "check yourself before you wreck yourself", "show me the money" or "go ahead, make my day".) That was when we decided it was time to leave. 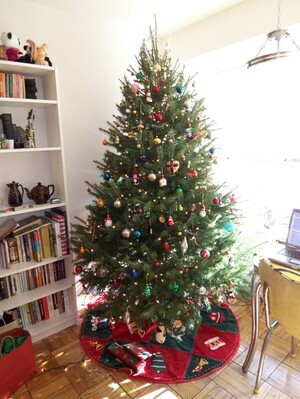 Yesterday evening, I got a Christmas tree. 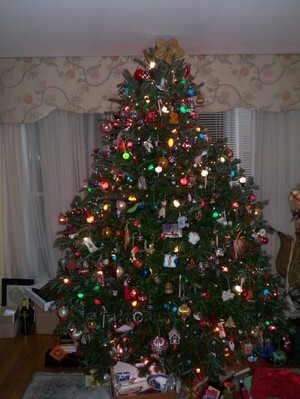 It's big and beautiful and seems very healthy, as it didn't loose too many needles on the way in. The tree itself is really massive. It's much bigger than I usually have, but of the three stands near my building, the one with the healthiest and best-shaped trees also had the biggest trees. I think it's much later than I usually go tree shopping, but there were loads of other people out too. I think the weather is screwing with people's idea of holiday weather. The high was 60˚ yesterday and today it might be 70˚. Perhaps if I leave my refrigerator open all day, I can manage to cool the world.